So break out the party hats, folks. Happy days are here again. The Premier who has promised to cut the price of gas for motorists – global warming, what global warming? – is also giving thirsty Ontario drinkers a break on the price of a low-rent frosty. And to sweeten the gift, he is doing it in time for the Labour Day weekend, the informal end of what has been a sweltering summer. So gas up the F-150, grab a two-four and head to the dock. But before you do, consider a couple of things. First of all, Mr. Ford is not cutting the price of beer. He is reducing the minimum price and inviting brewers to cut what they charge. How many will is an open question. It has been a decade since the government raised the floor price in the name of responsible drinking. It’s not clear whether brewers will want to sell one-buck-beer these days. Many smaller brewers are already saying they can’t. Their prices won’t budge. So Mr. Ford’s Progressive Conservative government is offering the brewers incentives to drop their prices. Under the “buck-a-beer challenge,” those who answer the call will get perks such as the right to better display on liquor-store shelves. In other words, the Premier who says he wants to keep the government’s meddling hands off the free market is changing the rules to manipulate the price of beer. Odd. Second, Mr. Ford is not really giving consumers a big break on booze prices. Wine, spirits, cider and draft beer are unaffected by his razzle-dazzle announcement. He is not cutting the provincial taxes that make up such a big share of the sticker price on alcoholic beverages. Queen’s Park will continue to collect more than half a billion dollars a year in liquor taxes, buck-a-beer notwithstanding. Mr. Ford pronounces that, “The days of the government putting its hand in your pocket each time you buy a two-four or six-pack is over.” Not so. It will be reaching deep into your pockets every time. 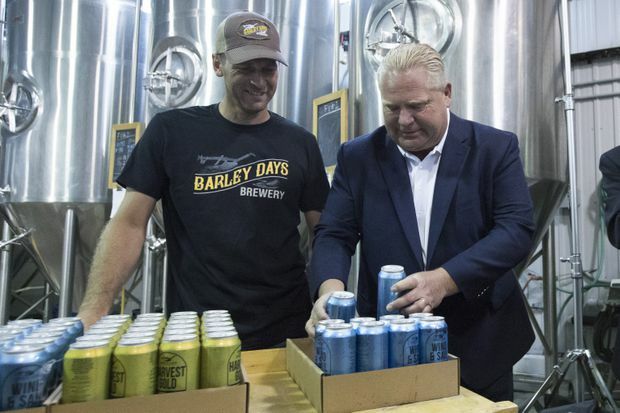 Premier Doug Ford, right, and Barley Days brewery employee Kyle Baldwin pack some beer before Ford's buck-a-beer announcement in Picton, Ont., on Tuesday. If Mr. Ford really wanted to help the average beer, wine or gin fancier, he would blow up the hidebound Liquor Control Board of Ontario and the equally sluggish Beer Store. Any Ontarian who has seen the beer wall at a Quebec supermarket or the selection of ales and lagers at an independent British Columbia liquor store can only marvel at the variety. Even after the half-baked liberalization by the previous government that put beer in some (but not all) supermarkets, liquor retailing in Ontario remains positively Soviet by comparison. There is no earthly reason governments should be in the business of selling booze. Although Mr. Ford has promised to permit beer and wine in corner stores – and cheers to that – it’s not clear if he has the determination to take the bolder step of getting the government out of liquor retailing altogether and leaving it to the private vendors, as most normal countries do.